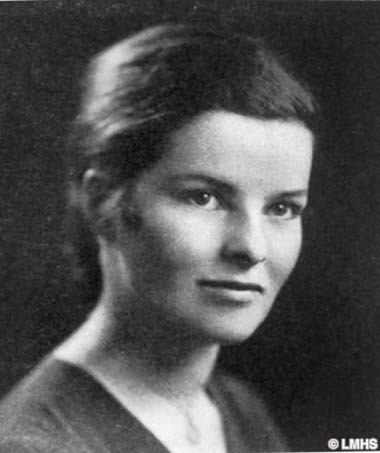 Katharine Hepburn from the Bryn Mawr College Yearbook 1928. Alice Palache first met Hollywood actress Katharine Hepburn in 1924 when they were classmates at Bryn Mawr, an all-women’s liberal arts college near Philadelphia, Pennsylvania. The friends were a study in contrasts. “Palache,” as she was called, was popular, a great student, athletic, active in student council, and from a conventional home in which her dad, a Harvard professor and staunch Episcopalian, considered it sacrilegious for her to play with friends on Sunday. “Kath,” on the other hand, was a loner, one of the worst students in the class, and did whatever she pleased. She dressed as a boy, smoked scented cigarettes in her tower dorm room, and jumped into the cloister fountain – naked – to wake herself up after cramming all night for an exam. In their junior year, Kath invited Palache to visit her family home in Hartford, Connecticut. 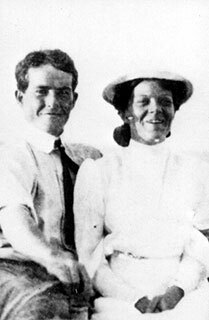 In between games of tennis, Kath and Palache spent time with Kath’s parents, Dr. Thomas Norval Hepburn and Mrs. Katharine (“Kate”) Houghton Hepburn. Both of Kath’s parents were highly-educated – Dad was a surgeon, Mom had 2 degrees from Bryn Mawr and was a prominent suffragette – and were militant public crusaders on the burning social issues of the day. 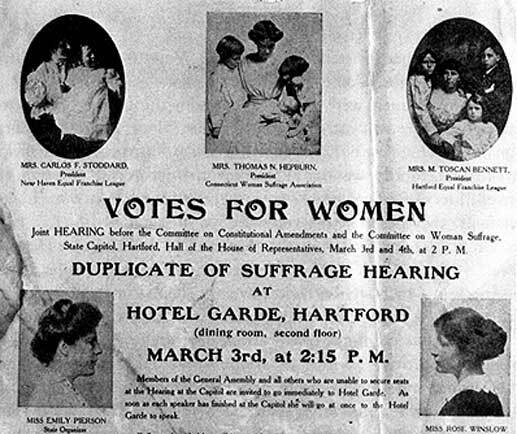 Katharine Hepburn’s mother, Katharine Houghton Hepburn, was a prominent suffragette from Connecticut. She is shown as “Mrs. Thomas N. Hepburn” in the photo at top center. Photo ca. 1925. Katharine Hepburn came from anything but a conventional home. 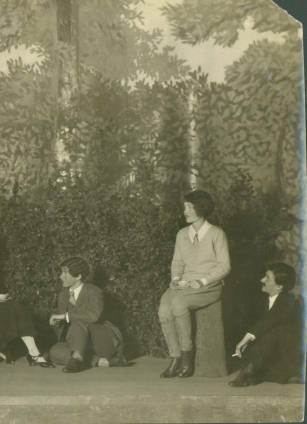 Katharine Hepburn, Bryn Mawr Class of 1928, is seen third from right in the dramatic production,”The Truth About Blayds,” by A. A. Milne. At an all-girls college, Ms. Hepburn had the opportunity to play male as well as female roles. Source: Leaming, Barbara. Katharine Hepburn. New York: Crown Publishers, Inc. 1995. Sherwood Anderson 3rd Wife Elizabeth Norma Prall Anderson use to Host and Help hide the affair between Spence Tracy And Katherine from His wife. When Elizabeth divorce was finalized she moved to Mexico. She opened up a shop. There she hosted a lot of Hollywood’s finest. I read her memoirs What is funny about her book and she was 86 years old when she wrote it. It comes across child like. Hello, I am wondering where you got the Hepburn/Tracy info? Hello, I don’t have any Tracy info on this post. What a delightful post! That explains a lot about Katharine Hepburn, a woman that I really admired but did not know much about her early life. CC, I named my daughter after Katharine Hepburn! Fabulous 🙂 Yay for the update! I spent some fun time on your story monster site. Love, love, love it. Thanks for the article about Kate Hepburn especially the photo of the suffrage meeting poster. I knew about her mom being active through my genealogy research of Mrs Carlos (Sandol) Milliken Stoddard. Connections like this are always fascinating to me. Thanks again.